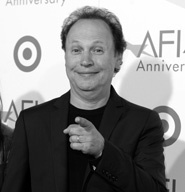 Actor and comedian Billy Crystal first came to audiences' attention on the 1970s sitcom Soap, and he quickly gained prominence as a cast member on Saturday Night Live. His character Fernando's catchphrase, "You look mah-velous," became a part of the national lexicon. Crystal starred in comedy classics such as The Princess Bride (1987), When Harry Met Sally (1989), City Slickers (1991), and Analyze This (1999), and hosted the Academy Awards eight times. He won a Tony Award in 2005 for 700 Sundays, his one-man play about his parents and his childhood on Long Island.